Your least favourite chore just got way easier. For some, cleaning the microwave is a daunting task, usually involving harsh chemicals, a few ruined sponges and a job not well-done. And because the stains and leftover bits of food are neatly hidden behind the microwave's closed door, it's so easy to procrastinate on cleaning it, leaving even more time for the gunk to harden and more excuses for you to put it off. Here's how you can break that vicious cycle: skip the cleaning spray, and pick up a few fresh lemons next time you're at the store. Start by pouring half a cup of water into a bowl or measuring cup. Then slice your lemon in half, squeeze its juice into the bowl and drop both halves in as well. Once that's done, slide the bowl into the microwave and set the time for 3 minutes or until the water boils. 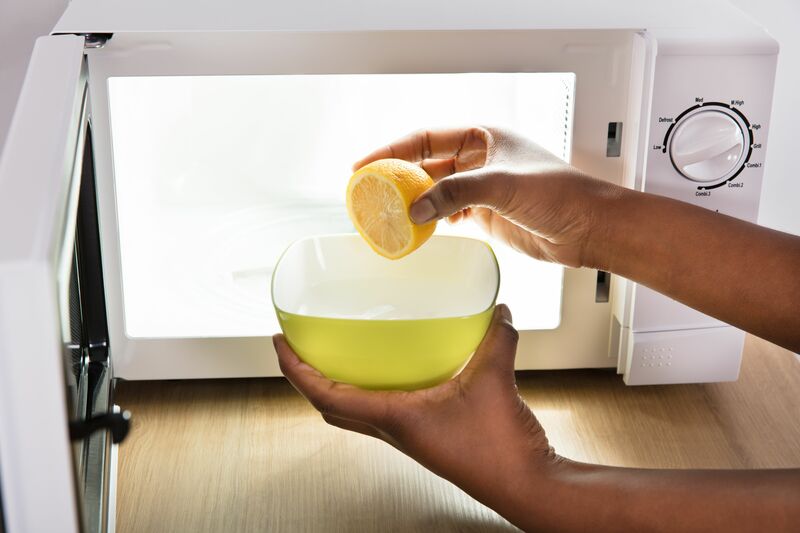 Leave the bowl in the microwave for another 5 minutes after it's done boiling, allowing the acidity from the lemon and steam from the water to loosen and dissolve those hard-to-scrub food stains. When 5 minutes is up, remove the bowl from the microwave and set it somewhere nearby. At this point, the lemon has done most of the work; you just have to wipe it clean. Grab your cloth and begin to wipe down the microwave-starting with the turntable, which you should be able to remove and wipe down separately. Then work your way inward, from the ceiling and sides to the bottom, finishing with the door. If you notice a few pesky spots leftover, dip your cloth into the lemon-water, then scrub until removed. There you have it: a spotless microwave that now has a delightful citrus smell.